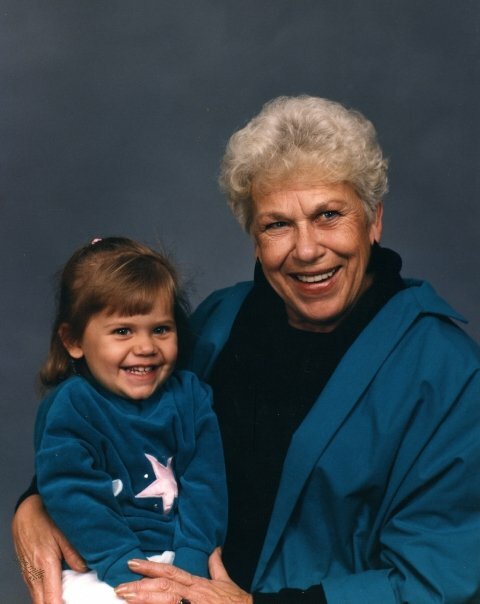 I had a pretty special Grama. 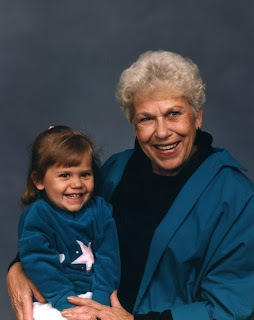 She passed away when I was 15, and while I have missed her every day since then, I've been thinking about her more and more in the last few years or so. When I was 15, I wasn't of the mental maturity to really process her death. I just shut my feelings (as well as the feelings of everyone else) out. At 15, I certainly didn't consider how I would feel about her at 27, with that little void that's been left in my heart, a husband, and baby boy. Rachel and I spent a lot of time with her, especially in the summertime. She religiously took us to the movie theater, musicals/theater productions, bowling, local parks, Sizzler, and Dairy Queen (hello, dipped chocolate cones), and let us watch completely age-inappropriate movies. It is to her that I blame my picky eating habits, because her apartment was stock piled with grapes, string cheese, mac & cheese, chocolate pudding, Hershey Kisses, M&Ms, and Pineapple-Orange-Banana juice. It is also to her that I credit my ability to lug massive amounts of grocery bags from the car and into the house in one trip. I love telling Ryan stories about her, and reminiscing with my family about her. If I think really hard, I can hear her laugh, hear her calling me "Lorny Lou Lou," smell her smell, and see everything about her apartment. Someday, when Camden is old enough to understand, I'll tell him stories about his great-grama. That way, he'll know how special she was too. Oh, Lauren. She wouldn't "be" proud, she is proud. I have no doubt she's watching over y'all from heaven. I love how she lives on in your heart. Oh My-let the tears begin. What a wonderful tribute to an incredible woman. Lou - I have no doubt that she's watching everything and is so very, very proud of you. I know that she would absolutely love Ry -- and I'm sure she would have already fallen completely in love w/Cam. I miss her so much too. I'm so grateful that you got to spend your first 15 years w/her. I know how much she loved you!!! Me too. Thanks for writing this beautiful reflection.